After a vacancy of 20 months, Covenant Reformed Church in Pella, IA, welcomed its new pastor when Rev. Doug Barnes was installed on August 19, 2012. Dr. Cornel Venema, under whom Rev. Barnes studied at Mid-America Reformed Seminary, and Rev. Spencer Aalsburg, a close colleague of Rev. Barnes, led most of the morning worship, while the newly installed Rev. Barnes concluded the service. Dr. Venema also presided over the first section of the installation portion of the service, reading the Form of Subscription followed by the vows of the minister and the congregation. Rev. Aalsburg gave the charge to the minister, based on 1 Timothy 4:6-16, and the charge to the congregation from Romans 10:14-17. A double mixed quartet sang, “I Sing the Mighty Power of God,” as an offertory. Rev. Barnes concluded the installation service by pronouncing the benediction. Rev. Doug and Grace Barnes have six children. Grace grew up in Florida and northwest Iowa as the daughter of Rev. Ralph Pontier. Having been raised in the UnitedMethodistChurch in western Pennsylvania, Rev. 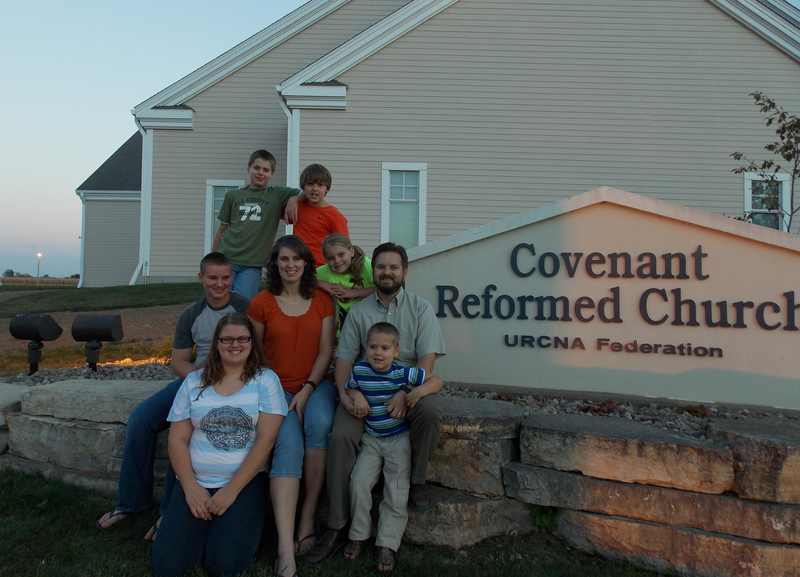 Barnes was introduced to Reformed theology at GenevaCollege, where he and Grace met and both joined the RPCNA. Rev. Barnes graduated from Mid-America Reformed Seminary in 2004 and subsequently served in the Hills URC (MN) for eight years. “Of course, God’s timing and provision were evident at every turn—from the house to which He led us, to the kind welcome we’ve received from the church family, to the warm welcome our children have received at their new school,” he adds. The above article by Glenda Mathes appeared on pages 9-10 of the October 24, 2012, issue of Christian Renewal.